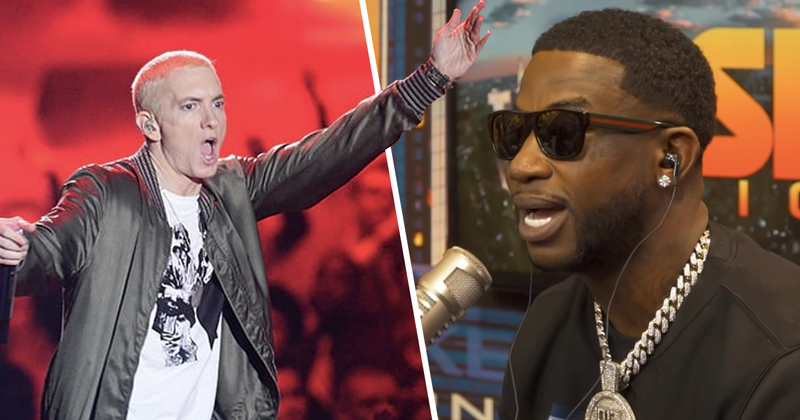 Eminem’s recent comeback has cemented his ‘King of rap’ status for many, but not for Gucci Mane. Gucci laughed as he was posed the question of whether or not Eminem should be considered the ‘King of rap’. Speaking to Rickey Smiley, Gucci Mane slated Eminem as someone he, nor other rappers, ever listen to. You got to come up with a better name. I ain’t playing Eminem in my car. You playing him in yours? You sliding around playing Eminem in the car with your old lady? There were however lots of people online who heavily disagreed with Gucci, citing Marshall Mathers’ over 220 million global record sales. Eminem has also achieved 10 number-one albums and five number-one singles while Gucci got his first number-one single in 2016 with Black Beatles. Earlier this year, Slim Shady’s tenth studio album, Kamikaze, officially earned platinum status. Eminem fans going after Gucci Mane as if he aspires to be Eminem. The 8-Mile star was also voted the ‘Greatest Rapper of All Time’ in a Ranker poll. The definitive list pulled together opinions from rap fans from across the globe, who each ranked individual rap musicians from the early eighties to present day.